just do their lizard pushups, swivel turret heads-- then wait. This poem first appeared in the Atlanta Review. Richard Schiffman splits his time between New York City and the Sangre de Christo Mountains of New Mexico, where his nearest neighbors are elk and horned toads. His poems have been published widely and a collection of them, What the Dust Doesn't Know, is forthcoming from Salmon Press. 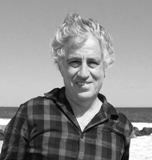 Richard is also the author of two biographies and an environmental journalist, because he feels that poems alone may not be enough to save the Earth. Hornd toads honored in a fine poem. Haste makes waste! Third time lucky - ' weird ' ! Ooh! I love them.... More poems have been written about toads and frogs than any other wired animal. A beautiful poem - I almost shed a tear. Great images of horned toads! The toads look so Jurassic...mini dinosaurs still reproachful, unhappy to be so far down the 'food chain' when they once ruled the world. But, they still have Attitude and this poem covers it beautifully. Great imagery, much enjoyed! I love the tongue-in-cheek tone of this poem. It's informative yet fun. Nice job! This is a great tribute to these homely critters. Especially like "roll of the Darwinian dice". Beautiful well written poem. Sent me to you tube to look for horned toads. One small quibble. They don't spit blood in your eyes, the blood comes from their eyes. Loved the poem, anyway. Wonderful use of the English language.